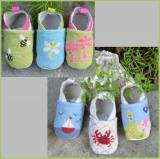 These are the famous Needlepoint shoes from By Paige. Back by popular demand!! These come in specific sizes so read the section. I have the leopard mules and Love them with jeans. I need more feet to wear all the shoes I own!! 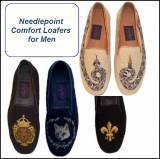 These needlepoint shoes will be delivered in about two weeks from the time you place your order. See the great Golf Club covers that are made with this line!! The booties make a great newborn gift. I love the new animal prints! See the needlepoint pillows also- I have several of them through-out my house. Just thought you should know even though I make the Monogrammed Clogs I own lots of the needlepoint shoes as well. I wear them to church every week! Love these cute sandals!! 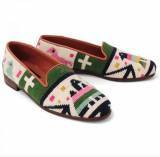 These beautiful hand stitched shoes are By Paige Needlepoint Shoes deigned by Paige Andrews. Click on the style you like to see all the beautiful patterns to choose from!